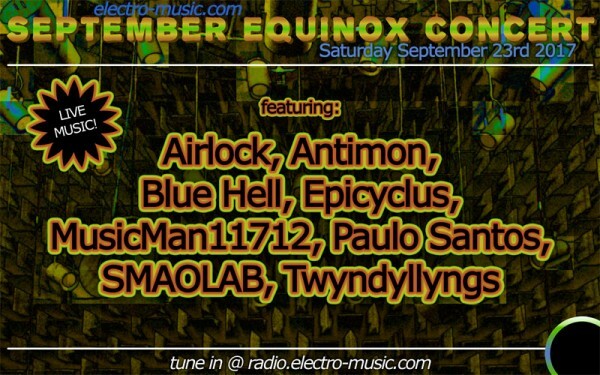 The event will be on electro-music radio on Saturday September 23rd 2017. Chez Mosc will play at the ususal time, but if you need more time on the schedule, we can do 1/2 hour. 8. Anything else you like to mention: Shed the grave's shell / Return to zero / Eat the first food / There is no "again"
6. Description (Style/Genre/Equipment, etc. - Optional): Probably an improvisation relying on some combination of textures, possibly rhythmic and melodic compositional elements, etc. using one or more usb keyboard controllers sending midi data to softsynths and/or older sound modules. 8. Anything else you like to mention: Thanks for organizing this event. I added you to the schedule. Dear Electro music team ! 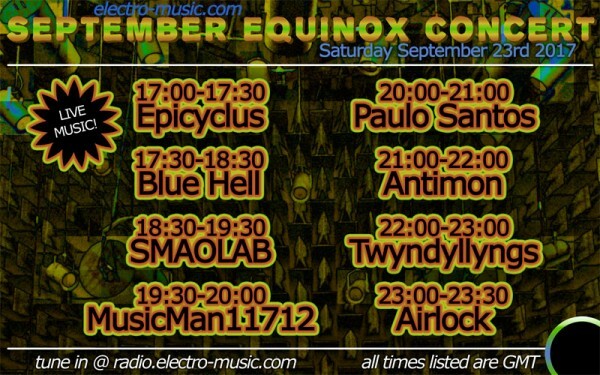 is there a possibility to play at this coming equinox live event ? 1. Preferred Start Time* (Please use GMT/Military Time): heu what ever you want, I take your choice as I am late ! 5. Location (City/State/Country - Optional): France, Alps. 6. Description (Style/Genre/Equipment, etc. - Optional): happy electro. 8. Anything else you like to mention: I love you ! welcome aboard chupchups I added you to the schedule. much attention to what's still available at the moment. If it's still possible to participate, I'd love to! 6. Description (Style/Genre/Equipment, etc. - Optional): Electronic Experimentations! Hope soon to get things done as I miss playing for you all! Huzzah! Another great poster for another great show! 8. Anything else you like to mention: Thank you Robsol and iSteve for E-M radio help. I just got word via email at Melting Transistor can't make the performance. Too bad. Thanks for the heads-up howard. I adjusted the schedule. The recording of my set. And my set. Trying to shake off the techno mode, I set up a bunch of non-sequenced instruments and tried to play them.